Our Speedwatch Group is live – please join! As readers will be well aware, the Parish Council and other concerned residents have been working in various ways to tackle traffic speed along the B2139 through the centre of our village. Following the recently installed traffic calming measures (still a work in progress) we are delighted to announce that we now have an active and properly equipped Thakeham Community Speedwatch Group! We are very grateful to Linfield Copse resident Ian King for setting up the group, and also to Global Associates Ltd. for their generous donation to buy a speed gun for the group to use, which was presented at an initial Sussex Police briefing event last week. 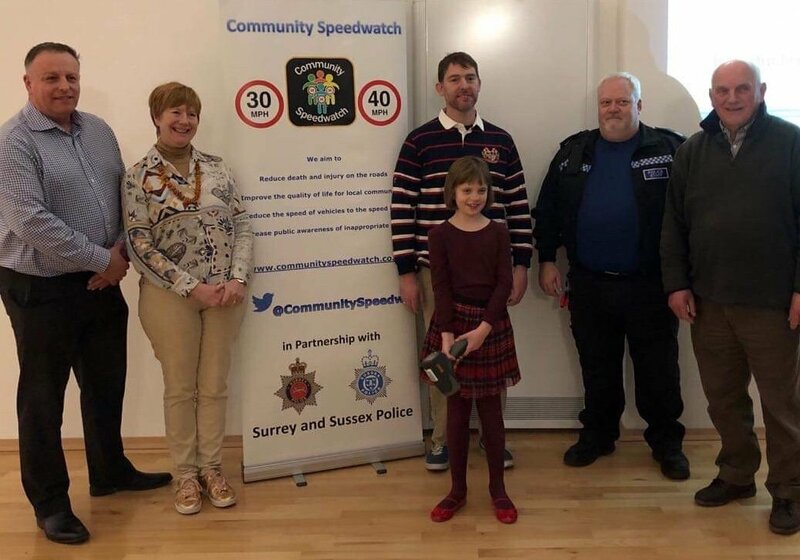 Young Sophia Wilton, holding the speed camera above, attended the event in honour of her sister, Ellie, who lost her life as a result of an accident in 2017. The regular visible presence of volunteers is intended to remind and educate drivers that speed limits are the maximum someone should drive at, and extra care is needed in residential areas like central Thakeham. The Parish Council will continue to support the volunteer group to be effective as possible in its work going forward.